Nights of New Plays Festival, 2013. Barnyard Theatre is a small theatre company that specializes in elaborate and innovative productions of new plays. Every summer we convert a hundred-year-old historic barn in the fields of Northern California into a nontraditional space and put on a show. Please Note: We are not currently accepting submissions. Please check back in early-mid 2014 for an update on submissions. We select our mainstage from the plays submitted to Barnyard Theatre, developed in-house, or recruited by company members. These plays are often showcased in our Nights of New Plays Festival. Serious dramas, comedies, musicals, short plays, each of these have taken a turn on the mainstage. The plays we're attracted to jump from the page and beg to be produced. We've developed something of an aesthetic over the years, but we are most excited when we are challenged to go beyond the familiar; in essence, we're looking for plays that will help shape an ever evolving aesthetic. We at Barnyard pride ourselves on our technical creativity. Many theatre companies specializing in original or new work are limited to producing plays that take place in an apartment living room or cafe because these offer fewer technical challenges. Send us that play, we'd love to read it, but don't be afraid to send us the play set on the pirate ship. Send us the play you love. We accept both short and full length plays year-round. Please, no metatheatre or backstage dramas. To get an idea of our aesthetic, take a look through our previous seasons. Production history: We'd prefer that the plays submitted have only had non-professional productions before Barnyard. Workshops, college, and university productions are fine. To showcase new works, both short and full-length, and hear new voices. To develop community by bringing audience and company out to the barn to witness and, sometimes, participate in the artistic process. To develop artists in the company by giving them opportunities to write, direct, perform, and explore new plays. To "audition" shows for the company. 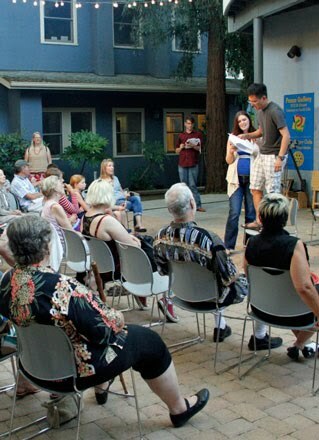 In the past, the Festival has included staged readings, performances, and workshops. Also, we provide plenty of homemade hummus for the audience. If you're local or able to make it to Northern California, you can submit your work to be workshopped. We've used a number of different workshop models, and we're interested in developing each workshop to suit the playwright's needs. Limit: ONE full-length or THREE short-plays. Make sure to include your full name, email address, and phone number in the body of the email. Please make sure that the title of the document includes both the play's title and your last name (example: "My Avisia Winger -- Oglesby"). This makes things much easier. A short synopsis in the body of the email would be very helpful. Please answer the following question: How did you learn about us? Has the play had previous readings, performances, etc? Feel free to include a bio if you'd like to introduce yourself. Please answer this question: Why is Barnyard Theatre a good fit? By submitting to Barnyard Theatre, you assert that the materials are original, and that proof of right(s), if applicable, are attached with the script. You also grant Barnyard Theatre the right to distribute the script to Barnyard Theatre members for the purpose of consideration for inclusion in the season.